I appreciate that these flat screen TVs are so much more appealing than the old bulbous TVs that demanded you hide them in an armoire. The elegant sleekness of HDTVs has been warmly welcomed into many households. Still, I feel like we are back in the Model T era when Henry Ford proclaimed that "The customer can have any color he wants so long as it's black." We are seeing very few divergences from this black motif and usually they are very subtle like silver of pewter. Those aside, the choice remains, matte black or glossy piano black. And designers seem to have reached their limit in flattening flat panel TVs. The thinnest of the LED TVs squeeze down to a little over an inch. 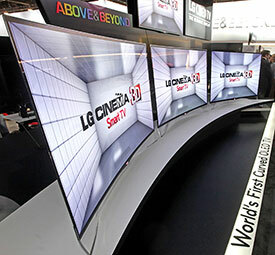 The slimmest of the waifs are the OLED TVs, which can almost attain credit card thickness. Though even with these skinny minnies, the connection panel will add a little bump out to their buttocks. Of course, if you don't plan on wall mounting, the TV's stand will increase their profile a few more inches. Because of the manufacturing process OLED screens can be curved and both Samsung and LG were displaying curved OLED prototypes at CES 2013. Also, if you are planning to squeeze the TV into a niche or that armoire, you can find dimensions in our HDTV database, which I discuss in the next section.